The cryptoverse is full of surprises that you are not likely to see in other communities. 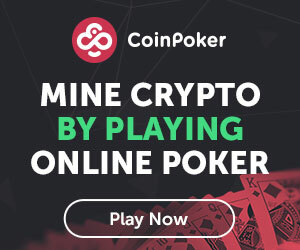 For example, in the few past days, the Ethereum Classic hacker has reportedly returned coins worth USD 100,000, a video game streamer was gifted over USD 70,000 in crypto for playing RuneScape, there’s (hopefully) a little baby out there who receives bitcoin donations for her college fund, and two guys have solved the famous Bitcoin puzzle in Paris - and the month isn't even halfway over. "We were trying to contact the attacker but we haven't got any reply until now. We still don't know the reason. If the attacker didn't run it for profit, he might be a white hacker who wanted to remind people the risks in blockchain consensus and hashing power security," according to the exchange. Meanwhile, popular live streaming service Twitch saw several separate donations in bitcoin to a streamer under the handle of Sick_Nerd, who reportedly received a total of over USD 70,000 from a user with the handle “lightpuma” while playing the video game RuneScape. If that money is genuinely real I'm not going to be a retard with it. That's a down payment on a house or something like that, no versace flip flops or anything I swear. And if the current economic situation has you worried for the coming generations, especially if you’re wondering how you’re going to put your kid through college at some point, take these people for an example (or, to be more precise, let's take an advert in The Times for an example, as no one knows if this is real.) 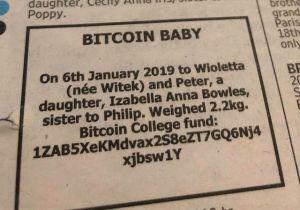 Wioletta and Peter Bowles had their daughter, Izabella Anna, on January 6th, according to the advert. 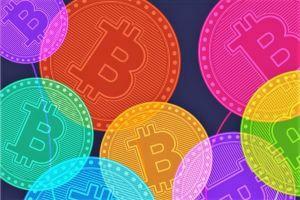 It also features a Bitcoin address, called the Bitcoin College fund, which currently holds 1.03293184 BTC, received through 150 transactions. This means that Izabella’s college fund holds around USD 3,710 as of the time of writing. As for those who were following the Paris Bitcoin treasure hunt, the puzzle has been solved. 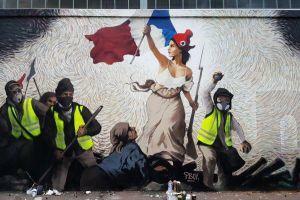 We think this painting clearly exposes the fight of French citizens who were always united during History to triumph over bankers lies. And if you’ve been in crypto long enough, these stories might not even surprise you. Crazier things have been known to happen, and even crazier ones could happen as soon as tomorrow. Meanwhile, go stream yourself playing something - you might get a stroke of luck too.